Boning is a notion that can be used for many purposes. Corsets and bustiers come to mind first, but strapless bodices are often made with supportive boning, as well. If you’re making a garment that calls for boning, I don’t recommend using the flimsy plastic stuff that’s available from your local fabric shop. It’s cheap, easy to find, and easy to use, but it doesn’t hold up under pressure. The best boning is made of steel: either spiral steel, which is flexible and intended for curved seams, or spring steel, which is meant only for straight seams. The problem is, corset supplies are neither cheap nor easy to acquire, unless you happen to live in one of the few cities that can boast a corset supply shop, like Farthingales. Most of us have to order our supplies online and that can get expensive, but there are alternatives to consider. Unfortunately, there isn’t anything you can use to replace a proper corset busk and you don’t want to cheap out when buying one. Less expensive busks are made of thinner metal and can bend, buckle, or even snap under stress. Always buy the best quality busk you can afford. But what about boning? You’ve probably heard about the concept of using plastic cable ties (aka zip ties) as boning. The question is, do they really work? It depends. Personally, I haven’t found any cable ties that are suitable for use in a Victorian corset. The resulting corset would be too flimsy and wouldn’t do a proper job. They do work great for mockups, however. The smallest cable ties are perfect for doll corsets. And I have successfully used them for Victorian bodices, as well. I usually layer two cable ties per boning channel, just to make sure I get the necessary stiffness and support. While cable ties are unsuitable for corsets, the much larger duct ties work beautifully for 18th century stays and pocket hoops. Duct ties are used to secure heating and air-conditioning ducts, so they’re more substantial than normal cable ties. 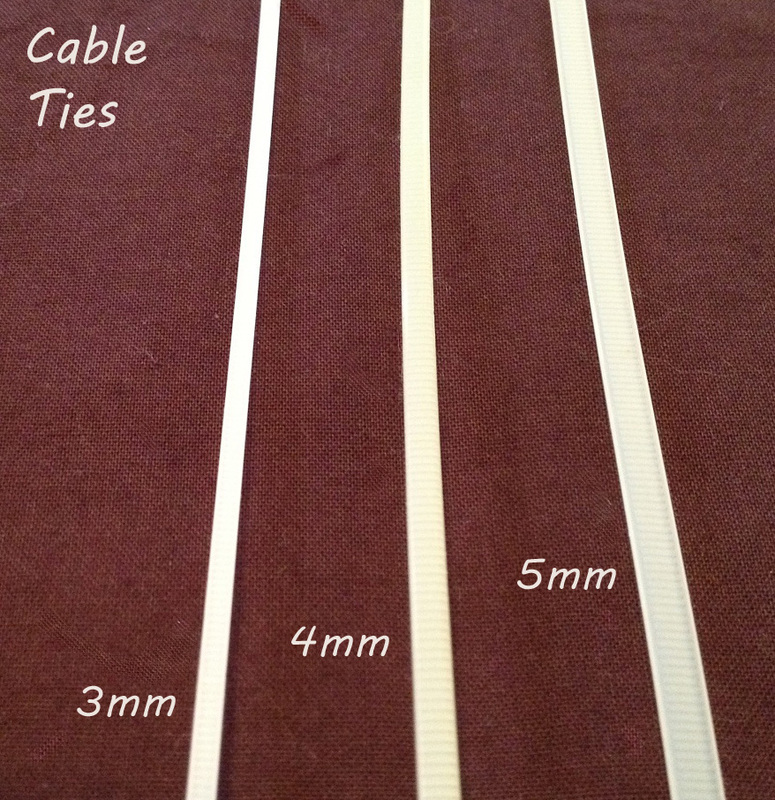 They tend to be 36” long, between 3/8″ and 1/2″ wide, and they’re much thicker than cable ties. Because of their width, duct ties are not suitable for Victorian corsets or bodices, but 18th century stays use wider boning, making duct ties ideal. Duct ties are quite flexible, so if you use them for pocket hoops, consider placing two duct ties per channel, just to ensure the hoops don’t collapse under the weight of your skirts. Why use cable ties instead of steel boning? Aside from being cheap and easy to find, plastic ties have many of the same properties as the baleen our ancestors used. I call them “artificial whalebone” because the plastic is firm, yet flexible, and it softens with body heat, molding to your shape as you wear it, just like whalebone. It has the added bonus of not being illegal to buy. Plastic cable ties can easily be cut with household scissors, making it convenient and safe to use. No wire cutters! The ends don’t need to be tipped or capped, either. Just trim them into a rounded shape and file any rough edges with a metal nail file. You can find cable ties at your local hardware store. 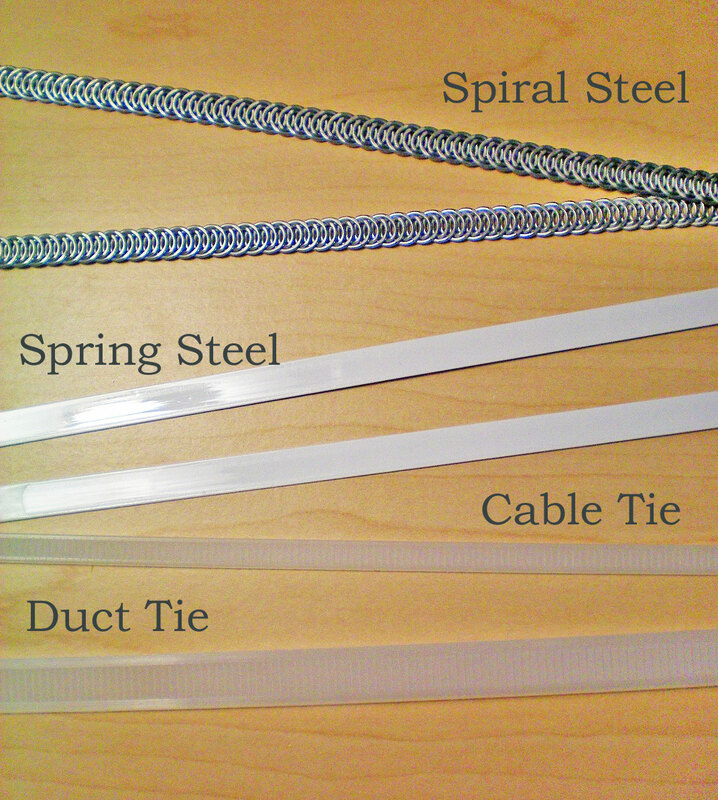 You’ll want 1/4″ cable ties for bodices and mockups of corsets or strapless dresses, and 3/8″ or 1/2″ duct ties for stays and pocket hoops. Look for ties that are thicker and therefore stiffer. The ties sold in the electrical aisle may be too thin, so check the heating and air-conditioning section. This is where you’ll find the industrial duct ties, too. The next time you’re at the hardware store, why not pick up a package of cable ties and give them a try? 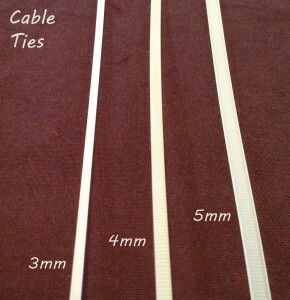 Do you use cable ties or duct ties for your boning? What limitations or benefits have you found? Do you have any suggestions to share? This entry was posted in Tuesday's Tips & Tricks and tagged 18th Century, Basics, Corsets, Lingerie, Modern Garments, Tuesday, Victorian. Bookmark the permalink. I’m giving duct ties a try for the first time this summer — I have to make 4 sets of Tudor era partially boned stays, in a hurry, that will be worn in the summer heat outdoors. (They will also get farthingales, but I’m using the $$ steel boning there and saving money on the stays). So far I’m loving how they look when laced up. I bought a pair of “aviation snips” to cut them, and found they needed LOTS of filing to smooth their ends. I would’ve considered the duct ties for the farthingales too, but 36″ was the longest I could find, and I’ didn’t want to splice them. Can you get longer than that? Thanks for your blog! Very informative! 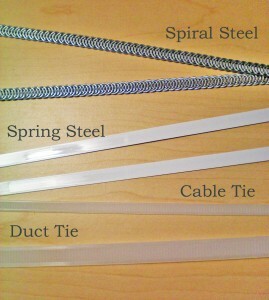 I haven’t found duct ties longer than 36″, though I suppose it’s possible they exist. You might check a supply shop for air conditioners and heating ducts, see if they have anything larger. Have fun with your Tudor event! Thank you! I was thinking about this but the smaller ones and i had to look it up to see what would work cause I forgot to buy the boning tonight ! The most important thing that goes into the corset! So thanks again! This helps! I recently needed something to support a pair of boots (not of leather) that kept slouching down. I knew boning was the answer but also that the boning you get at Joann’s would not be sufficient. I told my husband what I needed and he recommended the steel strip from windshield wiper blades. It’s stainless steel and just under a 1/4 inch. He uses it to make lock picks. It’s flexible yet durable. It was perfect for my need. Thank you! I’m making a dress for my niece for a school play, and trying to save money where I can. Zip ties will do the trick for the boning! If you’re using regular zip-ties, you might need to double them to provide enough support. That’s what I do when I use zip-ties for Victorian bodices. If you need more support than that, you can try duct-ties, which are heavier and thicker, but also wider. It just depends on what you need. Also, I recently wrote an article filled with tips on amateur theatrical costuming. If you’re interested, I can email you the PDF file, or you can wait until I upload it to the site, which should (hopefully) be soon. I went to the dollar store and bought a 10 pack of marshmellow/hotdog campfire roaster sticks. they are 3/8in wide each about 24in long and 1/8th inch thick. I had my boyfriend cut them with his grinder and smooth out the ends then bent them to sit flush after I finished seeing it all together. Fits Amazing!! Take 2 I marked my 3 in longer and had him bend the bones and tack weld/grind smooth and LOVE the rounded ends on the bones and they are strong. getting ready to go for #3 corset out if my $1 store campfire sticks! !